“Breast is best.” Mothers and mothers-to-be hear that constantly, and for good reason. Breastfeeding has a whole host of benefits for both mother and baby. But as a country, while we strive to push breastfeeding, when it comes to actually backing it up with true support, we fall short. And then we wonder why one of the most heated fights in the dreaded “mommy wars” centers around breastfeeding. A couple of years ago, New York City Mayor Mike Bloomberg created the “Latch On NYC” initiative. 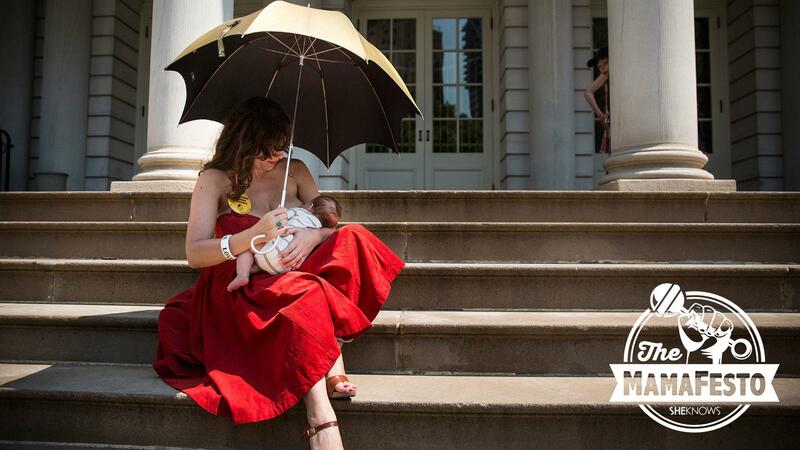 The initiative changed the protocol surrounding formula use in NYC hospitals and requires new mothers who want to use formula while still in the hospital to sign it out like medication. Nobody is denied formula, but if a mother requests some, she’ll receive a mandated talk from staff on why breast is best. When the initiative first came out, I wrote about how it wasn’t so much supporting breastfeeding as it was stigmatizing formula. And if there’s one thing new mothers don’t need any more of, it’s stigma over their decisions. Even when initiatives try to support breastfeeding, they somehow still end up missing the mark. What can we do instead? How can we close the chasm between breastfeeding and formula in a way that lessens the judgment and promotes true support? My favorite go-to fixes focus less on the personal and more on policy. If only we had better postpartum policies for families. Let’s say a woman wants to try to breastfeed but has only three weeks of leave after having a baby. She is going to have way more on her mind than figuring out breastfeeding, especially if it’s a bit tricky at first and she knows she won’t have the time or space to pump once back at work. Know what could be useful? Mandated, paid maternity leave. You know, like the rest of the world has. And while we’re at it, why not mandated paid family/paternity leave so those in two-parent households can have support from their partners? Beyond policy, we can take another page from other countries by instituting some sort of affordable, accessible and regulated milk share program for those who want to feed their babies breast milk but aren’t nursing for whatever reason. Modernized breast milk banks in Brazil have helped cut infant mortality by two-thirds and are now the model for many other countries. In Brazil, milk banks help provide an alternative to formula made with contaminated water, which can be dangerous for infants. It’s inspiring to see a developing country put time, money and effort into a workable solution like this — and to great benefit! And in Iceland, a country where having a milk bank isn’t economically feasible for such a small population, they’ve decided to import breast milk from Denmark to feed premature babies and other infants when mother’s milk isn’t available. Come on, U.S., get with the program. While we work on getting better policies and support from our country, let’s do what we can on the micro level. Support fellow moms. Offer information or advice if asked, but don’t judge. While it would be awesome if breastfeeding was more common, I do know that shaming and judging is not the way to get folks there.